Looking for a Used Civic Hatchback in your area? CarGurus has 20,202 nationwide Civic Hatchback listings starting at $13,500. The 2017 Honda Civic Hatchback is more of a good thing. The popular Honda Civic went through a major redesign for 2016. Both the coupe and sedan got a new look, new technology, and a new turbocharged engine option. This year, there’s a new model in the mix, and it’s the first Civic Hatchback Honda has sold in the U.S. since 2005. 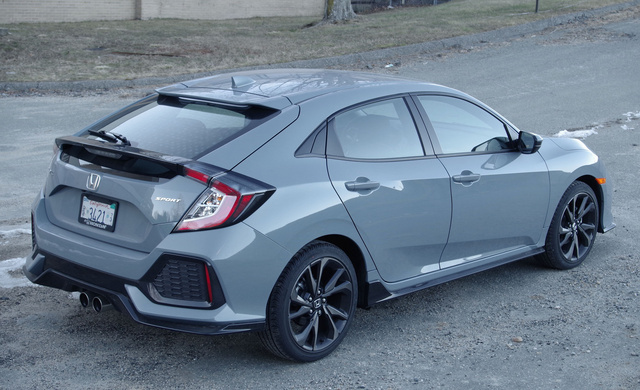 With its extra cargo space and sport-oriented tweaks, it’s aimed squarely at the stereotypical Civic buyer: someone who wants a practical, fun-to-drive compact car. I spent a week putting a Civic Hatchback Sport through it’s paces—from stop-and-go commuting to a highway slog with a hatch full of cargo—and enjoyed every minute. While any Civic is a safe bet, the Hatchback offers even more to love. The hatchback gets the same aggressive styling as the coupe and sedan, although blacked-out wheels and honeycomb trim are unique to the hatch. Another difference? While the other Civics are made in Indiana and Ontario, the Hatch is imported from Honda’s factory in Swindon, in the UK. The only downside of the design is its awkward proportions. Compared to the sedan, the hatchback’s roof is 0.8 inches taller, and the car itself is 4.3 inches shorter. 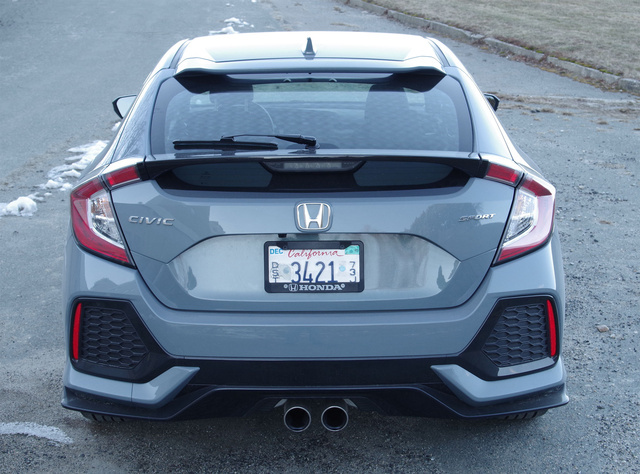 While the sedan and coupe look sleek and low, the hatch’s unbalanced rear makes it look snail-like. However, that’s the price you pay for 25.7 cubic feet of cargo space—10.6 more than the sedan offers. Inside, things are a bit more subdued. While prior generations of the Civic featured outlandish dashboards, the new interior is smartly laid out and feels sturdily assembled from quality materials. 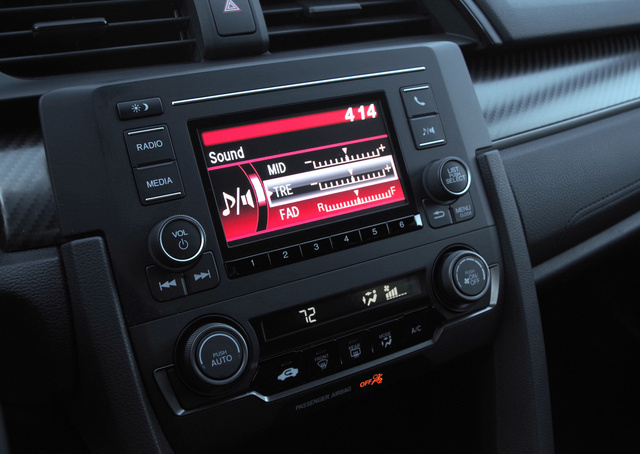 Soundproofing is effective, and Honda has done a great job keeping noise and vibration from intruding into the passenger cabin without isolating the driver from the road. 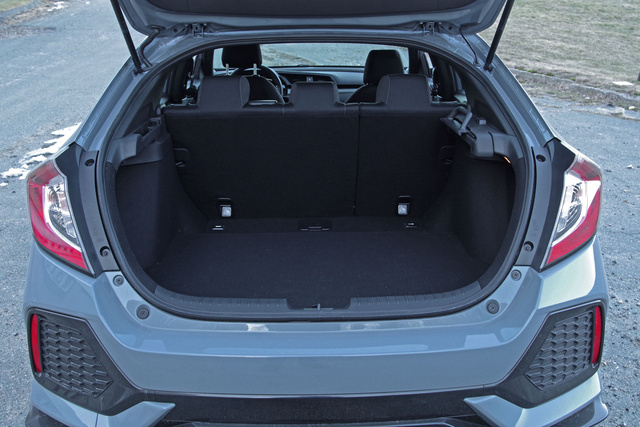 Other than the added cargo space, the only difference between the hatch and the sedan is a few fewer inches of legroom in the back—which aren’t missed, as there’s plenty of space back there. 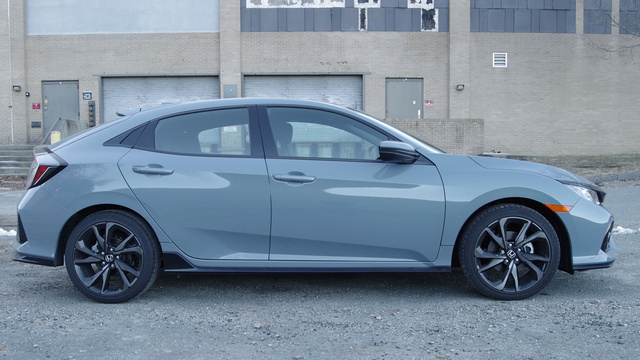 I’m sure a lot of Civic Hatchback buyers don’t care about driving and just want a practical, affordable car with a long history of reliability. But the Civic begs to be driven—and it’s so engaging that I wouldn’t be shocked if owners suddenly find themselves caring about hitting their apexes within a few months of ownership. 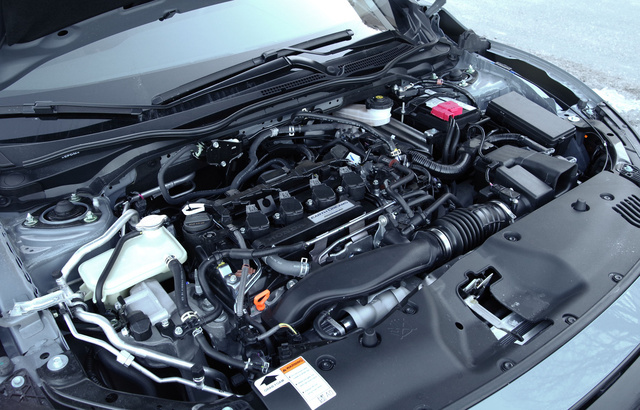 Unlike other Civics, the Hatchback comes with a single engine: a new-for-2016 1.5-liter turbocharged 4-cylinder. In LX, EX, and EX-L Navi trim, it’s good for 174 hp. A center-outlet exhaust on the Sport and Sport Touring trims bumps that number up to 180 hp. That little 4-cylinder might not be objectively powerful, but it sure feels eager to please. Honda estimates the Civic will take 7.8 seconds to reach 60 mph. That’s not bad for an economy car, but it seemed even more athletic in the real world. Whether I was merging on the highway or accelerating to pass, it never wanted for power. Paired with the 6-speed manual transmission that’s standard on the LX and Sport trims, it’s a hoot to drive. With the Civic’s light-but-linear clutch, the stick shift’s short throws and precise engagement make it fun to row your own gears even when you’re stuck in traffic. Most buyers will pick a continuously variable transmission (CVT) with paddle shifters, which is optional on LX and Sport trims and required for the EX, EX-L Navi, and Sport Touring. CVTs got a bad reputation when they first became popular a decade ago, but the Civic’s is unobtrusive—the ultimate compliment for an automatic transmission. My only complaint has to do with the electronic power steering. Standard on all Civics, it adjusts feedback depending on how you’re driving. 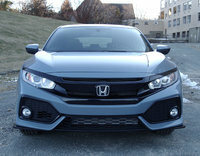 However, Honda recalibrated it to feel even sportier in the Hatchback, and I say that was a mistake. The steering feels fine at low speeds or when cruising on a straightaway. But under the heavy load of, say, an emergency lane change, the car suddenly tenses up. The whole setup is designed to give the driver more feedback, but the transition from relaxed to engaged is jarring. Despite its performance cred, the Civic Hatchback doesn’t skimp on practicality. While any hatch can fit cargo, the Civic has a few nice touches that make it a great hauler—whether it’s a trip to Ikea or a trip to the grocery store. I was especially impressed by the Civic Hatchback’s ingenious cargo cover: While most cargo covers install behind the seats and must be removed when the seats are folded down, this one unfurls from the side instead. That makes it a lot easier to carry large items with the back seats folded down. Even if you aren’t carrying a big load, there’s plenty of space for everyday storage in the center console. The chunky cupholders slide out of the way, revealing enough room to store items as large as books, paperwork, water bottles, and even small purses. And when you’re alone in the car, all that extra space doesn’t hurt your fuel economy. The EPA rates the Civic Hatchback LX with CVT, EX, and EX-L Navi as good for 31 mpg city, 40 highway, 34 combined. A stick shift removes a mile per gallon on all ratings, and the Sport Touring is rated at 30/36/32. You can order the Civic Hatchback with all the same useful tech you can get in the regular Civic—including a 7-inch Display Audio touchscreen that’s compatible with Apple CarPlay and Android Auto. On EX-L Navi and Sport Touring trims, it even comes with its own navigation setup. However, you can’t get Display Audio with a Volume knob. It’s a small complaint—volume up/down buttons sit on the steering wheel, and the touchscreen has a flat Volume slider—but nothing beats the utility of a knob for silencing the radio. You also can’t get any of that good tech when you order a stick shift. Instead, you’re stuck with an AM/FM radio with bluetooth and a single USB connection, manual cloth seats that aren’t heated, a key you have to take out of your pocket, and no active safety features. Upgrade to the Honda Sensing package—standard on the Sport Touring and an additional $1,000 on the EX-L Navi—and you’ll get collision-mitigation braking, lane-keep assist, and an active cruise-control setup that will follow the car in front of you even at low speeds. If your commute involves a lot of stop-and-go traffic, it’s worth it. Another good option for those who live in the city is LaneWatch, which uses a camera to display what’s in your blind spot on the dashboard touchscreen. It’s especially helpful when you’re sharing the road with cyclists. Even without active safety, the Civic gets good marks from NHTSA, which gives it a top rating of 5 stars in crash tests. While the IIHS hasn’t rated a Civic Hatchback specifically, the independent agency rates the Civic sedan as a Top Safety Pick. If you haven’t been following the automotive industry closely, you might be surprised at just how many hatchbacks are on the market in 2017. Still, the Civic Hatchback holds its own. Compare it to the Corolla iM—formerly known as the Scion iM. The Corolla is slower, doesn’t come with CarPlay or Android Auto, and generally feels less refined. The Mazda3 and Ford Focus are both fun to drive, but have less cargo space—and they are showing their age. We’d give the Chevy Cruze hatchback a try, even though it doesn’t have as much cargo space. The Volkswagen Golf is also appealing—especially if you want a stick shift but don’t want to give up keyless entry, leatherette, and CarPlay. Still, with its long history of reliability and high resale values, it’s hard to argue against the Honda Civic in any form. The addition of a hatchback just makes it even more practical. What's your take on the 2017 Honda Civic Hatchback? Brian_T_P Looks as good as he say's it is, who am I to doubt it? Bit too dear for my pocket though. 1Guruhas1 They still aren't making a high fuel mileage HF or HX model like they use to which got (HF) 51mpg highway printed on its dealer list of features. Big corporations must have squealed to the government to send Honda the other way, as seen in an article rejecting the 60mpg version patent. Oh well, another year of high horsepower advertisement/marketing at 40mpg. Users ranked 2017 Honda Civic Hatchback against other cars which they drove/owned. Each ranking was based on 9 categories. Here is the summary of top rankings. Have you driven a 2017 Honda Civic Hatchback?